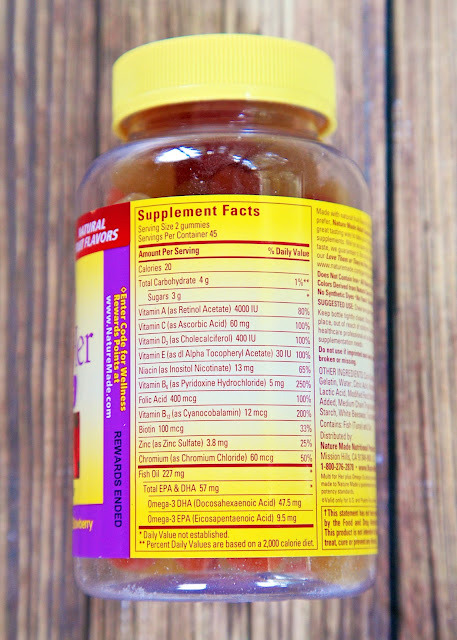 I received a free bottle of Nature Made Multi for Her plus Omega-3s Adult Gummies from Nature Made to review. Nature Made did not require that I write this post or any of the language in this post. All opinions and views expressed are my own. I don't know about you, but I sometimes struggle getting all of the daily recommended vitamins. It is especially hard to eat properly when I travel. In fact, American women only consume 14% of the daily recommended amount of omega-3s EPA & DHA from food alone*. I am definitely in the 86% of women that don't get the recommended amount of omega-3s EPA & DHA from food. To help me get the recommend daily requirement of vitamins and minerals, I take a Multi-Vitamin every day. I've been looking for a multi-vitamin that isn't a giant horse pill. I have a hard time swallowing those things, so I usually end up not taking the multi-vitamin. 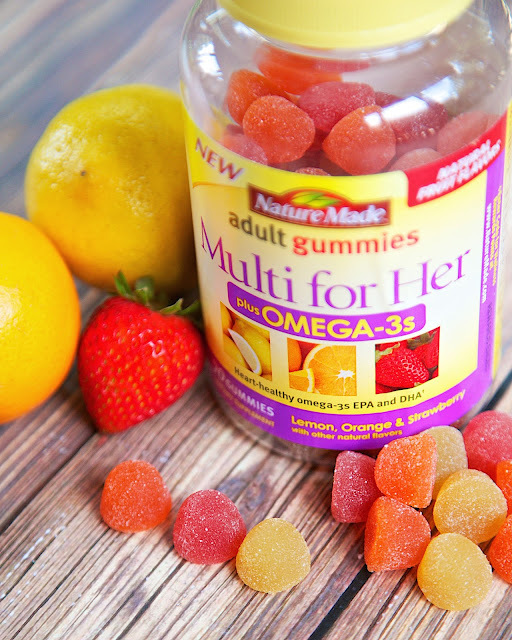 I received a sample of these Nature Made Multi for Her plus Omega-3s Adult Gummies and I absolutely LOVE them! They actually taste really, really good. They are like a sweet chewy fruit snack. I actually look forward to taking them! It feels like a guilty pleasure! They come with three flavors - lemon, orange, and strawberry. Plus they are made with all natural flavors, and the colors are derived from natural sources – there are no synthetic dyes in the gummies. I tend to be distracted by shiny object a lot of times. I am thinking about doing something, like taking my vitamin, and something else pops in my head, and I totally forget the first thing. To help me remember to take my vitamins every day, I keep them on the bathroom counter. It definitely helps me remember to take them. If I can see them, I will take them. My morning routine is to put my contacts in, take my vitamins and brush my teeth. I never have to worry about forgetting to take them. Multi for Her plus Omega-3s provide an excellent source of essential nutrients like vitamins A, C, D3, and E, as well as key B vitamins (folic acid, biotin, niacin, vitamin B6, vitamin B12) and minerals like chromium and zinc. There is no yeast in the Multi for Her plus Omega-3s. They are also gluten free. If you are looking for a fun and yummy multi-vitamin, I highly suggest giving the Nature Made Multi for Her plus Omega-3s Adult Gummies a try. They really do taste great and are so easy to take. Just eat two gummies a day and you are set! They are available at most Walmart, Target, Kroger, Walgreens, CVS, and Rite Aid stores in the Vitamins, Minerals, and Supplements aisle. I definitely look forward to taking my vitamins every morning. WAY better than the chalky horse pills I was taking!